I love photographing modern architecture and whenever I am in an airport I often find plenty of inspiration, they are invariably modern, spacious and well lit. Of course it is not always that easy these days to take photos, the usual idiotic response from officialdom is that when they see a ‘pro’ type DSLR you can bet taking pictures will be risky, this it is of course daft because most compacts and camera phones are more than capable of capturing good images; most of these were shot using a compact Lumix that happens to have a wide angle lens and gives good results. 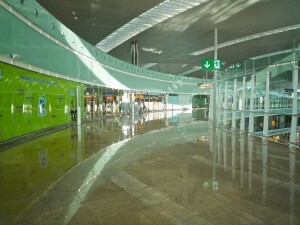 Recently Barcelona Airport (El Prat) opened its new terminal. I have been a few times now and it is still very clean and shiny and I love spending some of that free time we are forced to endure surreptitiously capturing this. In the pictures there is an almost liquid quality and the colour palette too is very much aqua like. I would love the time to actually photograph it properly and without fear of being viewed as a security risk. Included in this post are a selection pictures I have collected to date, they are bound to be more I have yet to revisit and of course I will being taking more in the future, security permitting.